"For Många Ord Om Karlek" - Niklas Strömstedt: This is an OK start, although is so retro that it probably belongs in the 1968 MF rather than the 2008 one. "If I Could" - Calaisa: Corrs-type close harmony country-folk-pop which is probably only there to make up the numbers but sounded pleasant enough. "Pame" - Daniel Mitsogiannis: This year's "Cara Mia"!! Will it have that killer key change I wonder??? "Hur Svårt Kan Det Va" - Linda Bengtzing: Now you know I've never really been a fan, but this is possibly her best ever entry at MF, and like Rongedal, it has a severe attack of the Grace Kellys! Very agreeable schlager. "I Lågornas Sken" - Nordman: I must be in charitable mood tonight because there's usually only so much of these brooding baldies that I can take, but I even found this ok.
"That Is Where I'll Go" - Sibel: Huge power ballad which should ensure qualification for the ex-Idol contestant if she gets the vocals right tomorrow. Not really my cup of tea though. "Ingen Mar Så Brå Som Jag" - Fronda: possibly this week's novelty song, and would sound better outside MF but I even had time for this one. "Hero" - Charlotte Perrelli: more modern sound than I expected from her. I've never really been a fan of hers but this will probably change that. High-powered pop schlager which I'm sure she will deliver with ease. Think this has got a bit of the "Det Gor Ont" about it too. To Globen: Charlotte and Linda. Oh, and Charlotte's going to win Melodifestivalen this year. Black and Gold - Sam Sparro: exceptional, classy, adventurous pop song which I have played this week more than any other, and is possibly the first serious contender for inclusion in the EuropeCrazy 2008-50! La Histeria - Marquess: this song has its own little party going on! Fascination - Alphabeat: hyper-happy pop from Denmark which my local radio station played the other day! It will probably be too upbeat and cheerful for us over here in the land of dreary-pop. Happy Together - The Jam: still got this 80s oldies vibe going at the moment (there's a post coming about that soon I promise) and this was a great song from their album "The Gift". Ready For The Floor - Hot Chip: no I still haven't heard their album but I'm still enjoying this little electro-pop song. Sun Goes Down - David Jordan: the more others hate this, the more I love it! We Keep On Rockin' - Alcazar: took a couple of weeks for me to appreciate this comeback track but it's finally made it to the playlist. Welcome back! No Melodifestivalen tracks on the playlist yet, I'm waiting till they're all available in studio versions - at which time you can expect Ola, BWO, Patrik Isaksson and Rongedal to make the list - and there may be some treats in store from this week's heat too. Will check out this week's sound clips either tomorrow or Saturday and do the usual preview and predictions too. Guess who's going to Riga???? Yes, tonight I can finally reveal the first of our holiday destinations for 2008. I will be heading off to the Latvian capital in May, accompanied as ever by my faithful travelling companion. We are both so excited about the prospect of visiting yet another new country! As ever, I will be writing about it on this blog. Riga here we come!! Last night's third MF heat kicked off with Kristian Luuk in fine form - he is really growing on me and I am beginning to get his humour although I can't understand much Swedish. I'm also loving those little in-between-song segments with Kristian competing against the contestants in sporting challenges which are good fun. Under-fire interviewer Nour El-Refai is also trying her best with the post-song interviews but I think that's a rather pointless segment. 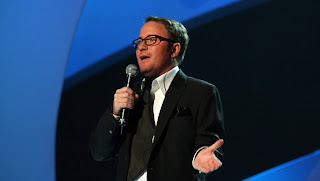 I've also had my reservations about comedian Bjorn Gustafsson in the past, but I thought he was funny last night. BWO kicked off the proceedings with "Hung Up" oh sorry I mean "Lay Your Love On Me". Admittedly I am biased as I like them anyway, but this screamed "Qualifier" from the beginning. It's not perfect - not as instant as "Temple of Love" - but it's more than good enough for the final. Shallow Alert! I love Martin! The presentation of Mickey Huskic's song just reminded me of all that Zeljko/Hari type Balkan power ballad stuff which always does well at ESC. Not a qualifier, although (slight) Shallow Alert! He was quite nice to look at for a while. Frida Muranius featuring Headline: their feelgood song also screamed "Qualifier" to me, a real crowd pleaser even if the backing singers' evening wear didn't match the street fashion of the main singers. She was very bubbly and I quite liked her last night. Thérèse Andersson was surprising. Everyone will remember her as a member of Pay TV, but that whole schlager meets opera sound came as a real shock to me. I didn't see "When You Need Me" as a qualifier but there you go....and what about that dress? Although Patrik Isaksson isn't the most visually appealing act, I really liked "Under Mitt Tunna Skinn" because to these ears it sounded like a blend of "When The Night Comes Falling" and the fabulous "Varlden Utanför" - how good a recommendation is that. I'll probably play it a lot more too when I get the CD. I know that Caracola have their fans, but "Smiling In Love" was just too much for me. Terrible, terrible lyrics and for me this is Melodifestivalen at its worst. As they sang it I had this fear that it would qualify, and it did. Based on the clips, I saw Ainbusk qualifying but that was until their dire rendition of their Pling ballad-by-numbers. They looked like "Desperate Housewives" and their performance (and result) was pretty desperate too. Finally, Eskobar. "Hallelujah New World" was OK, but was a fish out of water at MF. One of the lines went "searching for something good to come out of this" which I suppose summed it up. Despite being a wild card - and therefore usually a foregone conclusion to qualify - it finished last. So BWO and Frida featuring Headline are off to Globen, with Thérèse and Caracola to Andra Chansen. I've had time to think about it now - Patrik was robbed. Above: BWO, Frida and Headline celebrate their passage to Globen. Above: he may have missed out on qualification but Patrik Isaksson still manages a smile. Next week: the battle of the schlager-divas, ding ding, seconds out, round one - it's Charlotte versus Linda!! Oh Europe, where or when did it all go wrong....? CONGRATULATIONS ICELAND!! My favourite-country-which-has-never-won ESC has chosen my favourite entry from their national final. Well done to Eurobandid, aka Fridrik Omar & Regina Osk, who will represent Iceland this year with "This Is My Life", a cracking techno-pop number which should wake up the voters! IRELANDE DOUZE POINTE: I saw a bit of the Irish final: didn't hear much of the songs but the panel were unintentionally hilarious. This year's panel was Dana, Louis Walsh and Marija Serifovic, the latter of course won Eurovision last year and proceeded to bring her own individual brand of Serbian 'tact and diplomacy' to the proceedings. Highly entertaining. The songs: disappointing. The winner: beyond parody. Now when you say that Ireland's sending a turkey to Eurovision, you will really mean it. Disappointed for Donal Skehan, whose "Double Cross My Heart" was more Melodifestivalen than...well, anything in Melodifestivalen I guess. Frida & Headline to Globen! Therese Andersson & Caracola to Andra Chansen. Glad though that my three favourite songs of the night are through to the final 5 - "Lay Your Love On Me" by BWO, "Upp O Hoppa" by Frida featuring Headline, and "Under Mitt Tunna Skinn" by Patrik Isaksson and Bandet, which I all loved in their own different ways. Therese Andersson and Caracola also go top 5. Qualifying to Globen: BWO and Ainbusk. Yes I'm biased, but BWO have the most memorable pop song of the night, I've only heard the one-minute clip so can't compare it to the greatness of "Temple of Love". They are promising spectacular costumes and stage routine, and Martin will no doubt be looking as fabulous as ever. Ainbusk have been around for a while, and they may just get the 'ballad vote' amid all the uptempo tunes tonight. Qualifying to Andra Chansen: Frida Muranius and Eskobar. I'm not really a fan of Ms Muranius based on her one-big-hit-single but this pleasantly surprised me. It's uptempo reggaeton-style pop with some rap thrown in. Eskobar are one of this year's wild-cards and they usually have a good chance of qualifying. This is very different from the usual MF stuff and if they pull off a good performance this could be a qualifier. 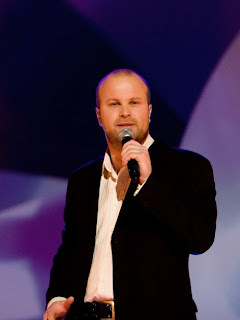 Patrik Isaksson is also on tonight and I was quite impressed with his song based on the clip which I heard - very reminiscent of "When The Night Comes Falling" which I loved. In this week's Sverige Topplistan singles chart, congratulations once again to Amanda Jenssen as "Do You Love Me" still stays at no.1. Basshunter's at no.2 with "Now You're Gone" and Alcazar's new hit "We Keep On Rockin'" climbs to no.4 from last week's no.17. Veronica Maggio, who became quite popular a couple of years ago is back with "Måndagsbarn", no. 34 this week, which like a lot of other stuff at the moment has a bit of an Amy Winehouse-retro-vibe about it. Velvet's "Deja Vu" is the highest new entry and the highest placed song from Melodifestivalen in the chart, with Michael Michailoff at no. 3o, Andra Generationen at no. 36 and Brandur at no. 40. Everything will completely change in the singles chart in the next few weeks as it will be totally taken over by Melodifestivalen songs. La Histeria - Marquess: OK it's official now, I love this tune. Catchy and summery. Love Is Gone - David Guetta: since Quentin did a magnificent version of this last week on Star Ac I have been listening quite a lot to the original. The Headmaster Ritual/The Queen Is Dead - The Smiths: Hadn't heard these for a few years but had this sudden urge to play them, and remembered just how spectacular Johnny Marr's music was, even if it was always overshadowed by Morrissey's voice and words. Double Je - Christophe Willem: one I've dug out again after his triumph at the NRJ Music Awards. What a star he is, even if his image may suggest otherwise. The Murder of Love - Propaganda: another long-lost 80s oldie which I converted from vinyl to MP3 so I could listen to it anytime on my iPod. Do You Love Me - Amanda Jenssen: still loving this. And it's still better than any of the Amy Winehouse-copycats doing the rounds. Always Always - Zuma: first of my MGP favourites which I'm still listening to even though that's over for another year. Colliding - Nicholas Carlie: I'm not sick of this one yet either. Classy contemporary swaying pop ballad. Work - Kelly Rowland: This is another of these songs which I didn't really like for a long time but now I do. I wasn't at EuropeCrazy HQ tonight so missed watching the awards show live, but will catch up with it over the next few days. Anyway I had a look at the results and here's a few thoughts. YAY! for Take That - two awards (best live act and best single) proves that they were - and still are - the world's greatest ever boyband, or should I now say man-band ha ha. BOO! for the tedious, overrated Arctic Monkeys winning best album and best British group: is this really the best that we can do? Even worse, they have spawned millions of equally tedious imitators. EH? for Mark Ronson winning Best British male artist. Now I have loved his interesting cover versions with guest vocalists over the past year, but would it not have been better to give it to someone who actually sang on his own record? OH GIMME A BREAK! for Kate Nash winning the Best British female award. Is it just me, or is it cause I eat so many lemons that I am so bi-tter? ???? for Adele winning the new "hype of the year" oops I mean "Critics Choice" award. How about "Most hyped act kept off no.1 by Basshunter"???? I might have more to say once I watch the show. It goes without saying that it was probably rubbish as usual anyway. Been a while since I wrote about what I was watching on the box so with it being catch-up week it was a good time to...catch up! "Harry Hill's TV Burp" (ITV1, Saturdays) is still, IMHO, the best thing on British television even if it has got a bit lazy of late: still, he is fantastic at this, and every show will always deliver an amazing visual gag or ten. "The One And Only" (BBC1 Saturdays) has now ended what will probably be its (sorry) one and only run, as so few people ended up watching it that the show's title possibly described its viewing figures. Basically it was X-Factor for tribute acts: Madonna, Britney, Kylie, Diana Ross, Cher, Dusty Springfield, Tom Jones, Rod Stewart, Robbie Williams, Lionel Richie, Elton John, Frank Sinatra, with the winner getting a 3 month contract in an American tribute show. The most fascinating and controversial contestant was the ginger-haired white guy who transformed himself into Lionel Richie; but the eventual winner was Dusty Springfield. My mum (a Dusty superfan) was none too happy with this impersonator's efforts. "Dancing On Ice" (ITV1 Sundays) continues to be the usual over-presented drivel. Every year I try to like it, but every year it ends up driving me round the bend. Chris Fountain and Gareth Gates are my favourites this year, particularly "Fearless Fountain" who is very confident and daring on the ice. Of course every year there is a judges' "chosen one" and this year it would be Suzanne Shaw, famous only for being in Hear'say and for dating Darren Day. I think the words "no comment" come to mind at this point. "Ashes to Ashes" (BBC1 Thursdays) is probably going to disappear off my viewing radar now, as the most long awaited TV show of the year turned into a very damp squib. Basically it's a remake of "Life On Mars" only without the great John Simm, but with a female-in-a-coma and Gene Hunt and his colleagues all transported back to 1981. It's too 'knowing' and it tries just a bit too hard whereas "LOM" was constantly full of surprises. Star Academy 7 - The Final, 15.02.08. Guests: Johnny Hallyday, Patrick Bruel, Isabelle Boulay, Jenifer, Pascal Obispo, Raphael, Peter Cincotti, David Guetta, Matt Pokora. The finalists: Quentin Mosimann versus Mathieu Edouard. Prepare for a completely biased and one-sided review. Mathieu was out of his depth singing with supercharged Johnny Hallyday on "Tout La Musique". Unlike Quentin, who stamped his own trademark vocals on "Il Suffira d’un Signe" with Pascal Obispo. Where would we be without good old "Casser la Voix" on Star Ac. Even Bruel sounds bored singing this, and Mathieu wasn’t great here either. I like Jenifer of course, but "Comme Un Hic" does nothing for me at present. Possibly that will change. Does she ever not look good though? Quentin is a star. Raphael and "Caravane" - another musical style more suited to Jeremy, whom I thought was the other obvious finalist, and another style for Mathieu to flop in. At best he is only a fifth-rate Corneille. Oh no...that old reality show staple "Angels". Quentin in a pink suit surrounded by dazzling dancers in bright yellow neon dresses. Despite the distractions, this was subtle and rather nice, although I’ve still had a gripe all season about all the English-language songs. Quentin, Peter Cincotti and David Guetta: "Love Is Gone". An absolutely amazing showstopper. Acer Ben’s already hailed this one and no wonder: an incredible blend of dance and jazz. Welcome to Quentin’s musical universe. Nice to see Isabelle Boulay again, doing a medley with Quentin and Mathieu. This was probably Mathieu’s best effort tonight, and more suited to his vocal style. Oh no (again) ..."I Believe I Can Fly", with Mathieu. I can’t listen to this without thinking of the mono-brow guy from Pop Idol 2 doing this in his audition. That was better than this, which was just weak. "Vous". Bruel again. I’ve never been a fan but Quentin did well here too even if it’s not my kind of thing. "Mon Frere" is yet another of those clash-of-the-titans songs on Star Ac. Yet again credit must go to the fab Kamel Ouali whose extravagant choreography and staging always lifts Star Ac above every other reality pop show on the planet. I thought both Q and M did well here. Would Quentin be able to compete with Johnny Hallyday on "Marie". Do I need to answer that? "Un Homme Heureux" - well I just think of Mathieu Johann and Maxim Nucci duetting this on Star Ac 4....this year it was another Mathieu, in duet with Pascal Obispo. Quite nice performance actually, but by this point Mathieu knew that he was beaten. And finally - "Tant Qu’on Reve Encore" from Le Roi Soleil, a song with such a great emotional pull. So quite fitting that both boys closed the show with it. Mathieu a bit wobbly vocally though. Now all we needed was the result....to say the drama was all too much for Quentin was an understatement. He fell to the ground! I definitely agree with Acer Ben about his over-the-top reaction! He must have wanted it so badly. 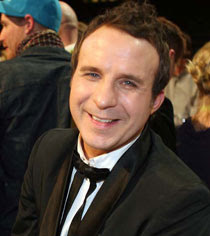 Quentin won with 52.6% of the votes cast. The difference between Quentin and Mathieu: star quality, charisma, consistency, justified arrogance and sheer talent. One had it all...one could only watch and learn. Quentin has put the ‘Star’ back into Star Academy. Now the hard work starts and we hope that he can deliver some great music in the future. Congratulations to a very worthy winner. But what now for Star Academy? Ratings have fallen, and the introduction of the professional jury on the prime and giving them rather than the students the right to save contestants has destroyed a major part of the show which made it special in the first place. An 8th season has been confirmed - but two very familiar faces won’t be there. Profs Matthieu Gonet and Raphaelle Ricci have both confirmed they are leaving the show. Only time will tell how long this show will survive. Oh and TF1 - can we have the old start time back (beginning of September) pretty please? Merci! That Brit Awards preview and predictions. Not long now till the annual back-slapping celebration of the past British musical year. At this point I will attempt to predict who will win awards: bear in mind I usually and inevitably get them wrong. And remember just because I'm predicting the winners doesn't always mean I like them! Best British Male Solo Artist: Jamie T/Mark Ronson/Mika/Newton Faulkner/Richard Hawley. Prediction to win: Mika. Best British Female Solo Artist: Bat For Lashes/Kate Nash/KT Tunstall/Leona Lewis/PJ Harvey. Prediction to win: Leona Lewis. Best British Group: Arctic Monkeys/Editors/Girls Aloud/Kaiser Chiefs/Take That. Prediction to win: Take That. Best British Album: "Favourite Worst Nightmare" - Arctic Monkeys/"Spirit" - Leona Lewis/"Version" - Mark Ronson/"Life In Cartoon Motion" - Mika/"Beautiful World" - Take That. Prediction to win: "Life In Cartoon Motion" - Mika. Best British Breakthrough: Bat For Lashes/Kate Nash/Klaxons/Leona Lewis/Mika. Prediction to win: Klaxons. Best British Live Act: Arctic Monkeys/Kaiser Chiefs/Klaxons/Muse/Take That. Prediction to win: Take That. 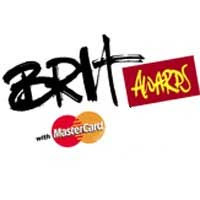 Best British Single: From a shortlist I reckon this will be a straight fight between "Bleeding Love" by Leona Lewis and "Valerie" by Mark Ronson featuring Amy Winehouse. Best International Male Artist: Bruce Springsteen/Kanye West/Michael Buble/Rufus Wainwright/Timbaland. Prediction to win: Kanye West. Best International Female Artist: Alicia Keys/Bjork/Feist/Kylie Minogue/Rihanna. Prediction to win: Rihanna. Best International Group: Arcade Fire/The Eagles/Foo Fighters/Kings of Leon/White Stripes. Prediction to win: Foo Fighters. Best International Album: "Neon Bible" - Arcade Fire/"Long Road Out Of Eden" - The Eagles/"Because of the Times" - Kings of Leon/"X" - Kylie Minogue/"Echoes Silence Patience and Grace" - Foo Fighters. Prediction to win: Foo Fighters. I'll be back here on Wednesday night with the results. Today the BBC announced the contenders who will compete for the increasingly dodgy honour of representing Royaume-Uni at the Eurovision Song Contest in May. The contest, formerly known as "Making Your Mind Up" is now retitled "Eurovision - Your Decision" which is a bit of an incorrect description as there will be three head-to-head duels with a jury - not the public - deciding who will go through to the final sing-off. 1. The solo/soul singers: Michelle Gayle versus Andy Abraham. Now I know she's had hit singles and all that, but she will still always be remembered as her off Eastenders and has been out of the limelight long enough to merit the 'hasbeen' tag. Her song is called "Woo" (!) meanwhile Andy was the singing binman from X Factor, the finalist who wasn't Shayne Ward or Journey South. His song's called "Even If" and both acts here are promising uptempo soul-pop. 2. The girl bands: LoveShy versus The Revelations. LoveShy are the two remaining members of Clea, the band formed out of all the "Popstars: The Rivals" girls who weren't Javine or Girls Aloud. Their song is "Mr Gorgeous" the title sounds just camp and cheesy enough to appeal to the voting demographic.....whilst I know nothing about The Revelations, a trio with a song called "It's You". One of them is Swedish, which might be reason enough to love. Or maybe not. 3. The Joseph-reject versus the Maria-reject: You'll have guessed by now that it's a bit of a casting-show fest this year. Rob "the builder" McVeigh will sing "I Owe It All To You" described as a power ballad. Oh dear.....meanwhile Transylvanian-Maria, Simona Armstrong, Romania's most famous musical export to the UK since the Cheeky Girls, will sing "Changes". Shamelessly obvious attempt to get the Romanian vote. I haven't heard any of these songs and will probably try to avoid them until the 1st of March, when one of Europe's most embarrassing national finals will take place. Who knows? They might surprise us. But then again, probably not. Apologies for the lack of activity on the blog this past weekend. Retro Saturday: none last night, purely because I was in Melodifestivalen mood and decided to watch my MF DVDs from the last 3 years instead. Normal service resumed next week. Star Academy: Delighted that Quentin won - I thought from the beginning that he had real star quality and raw talent but the test now will be how his career is managed. I'm still watching the video clips from the final and will post my review in the next couple of days. Brit Awards: yes it will soon be time for Britain's biggest music awards show. Preview and predictions will be on here tomorrow night. I'm trying to be interested, honestly I am, but the fact remains that British music is not exciting me at the moment in the way that European music is. That's not to say there isn't any good British music at all - there always is, if you dig deep enough - but there is too much focus on hype-over-content at the minute. It may come as a surprise that much of my favourite music for the last 25 years has come from British 'indie guitar bands' but I'm particularly disappointed at the tedious crop we have here in the UK at the moment, to the point where I don't really want to hear that kind of music anymore, as long as it's being played by the Arctic Monkeys and all those dire Libertines soundalikes. Rant over. Because I need to catch up, there will be lots of posts between now and next weekend - which will also be a big, busy one as it's national finals "Super Saturday". I know a few people out there didn't really enjoy tonight's Melodifestivalen, but I did, although I still feel I haven't yet heard the winner. Anyway I (foolishly) made predictions in my previous post but was quite amazed that I got all four qualifiers right, even if they were in a slightly different order. A surprising sighting of Måns Zelmerlöw to open the show (in a very dodgy cardigan! ), but the real opening was Ola with the night's first song "Love In Stereo". Although he looked very good (getting shallow here!) his vocals did not quite match his good look and this seemed to set the trend for the early part of tonight's show. Visually, Lasse Lindh reminded me of Fame Academy's Alistair Griffin, but unfortunately his song was a non-starter due to his nervous vocals. Little Nicole Fuentes - a.k.a. The Nicole - delivered some entertaining choreography on "Razborka" which I actually found quite memorable in spite of it being vocally hellish. Borka-borka-borka and get your booty on the floor. As you do. By the time we reached Alexander Schöld, I decided that I was in love with him. His upbeat guitar-schlager-pop was always going to be popular with me, although he too fell foul of the vocal curse which blighted tonight's contestants. Prior to the contest I had decided that "Just A Minute" by Rongedal was my favourite of tonight's songs. Two identical brothers dressed in matching red suits, but what they lost in visual appeal they made up for in professionalism and confidence, what had been lacking tonight up to this point. I have never liked Sanna Nielsen, but credit where it's due - she delivered a simple ballad with the right amount of subtlety and avoided her usual overpowering vocals. What do I say about Andra Generationen? Bonkers, Balkan, brassy. Tonight's comedy turn, another in a (disturbingly) long line of joke entries at ESC this year. This again made me smile, but thankfully it didn't go any further. Finally, the top of the bill this evening: (Andreas) Johnson and (Carola) Häggkvist. Thought at one point that she was going to strangle him. She still dominated this duet and I thought she could have taken lessons from Sanna Nielsen tonight in how to keep it simple. Amazingly though, for a Carola-hater like me, that I actually found this more bearable than I thought it would be. Anyway I got my pre-contest prediction right, even if it was in the slightly wrong order. Sanna and Rongedal to Globen. Ola and Andreas/Carola to Andra Chansen. Major shock that Queen Carola didn't automatically qualify to Globen - has the bubble burst at last? (Nooo....too much to hope for) anyway I enjoyed this week's show a lot more than last week, although it's a long way from being classic Melodifestivalen and is certainly falling short of the expected standard. But nevertheless, credit to SVT for putting on another well-staged spectacular, although I've decided that the poor set this year is also letting the artists and songs down. Next week: BWO!!! Yay! Hope they deliver a great performance. Fingers crossed :). A kind of distant relative of "SOS" although not as instantly catchy, but it sounds like a good pop song and I'm looking forward to the live performance. Prediction: Qualifying to Andra Chansen. 2. "Du Behöver Aldrig Mer Vara Rådd" - Lasse Lindh. A pleasant enough song, in the current musical style of the likes of Keane or Coldplay, although will probably be an also-ran tonight. 3. "Razborka" - The Nicole. Fun and feisty stuff from what looks and sounds like a Britney clone. Will the voters be saying 'Gimme More'? Probably not but I could imagine this being a fan favourite. 4. "Den Första Svalan" - Alexander Schöld. Uptempo and nice pop tune, again not too memorable but will probably need to see the live performance to judge it better. 5. "Just A Minute" - Rongedal. 6. "Empty Room" - Sanna Nielsen. A ballad from her for a change, I'm not really a fan of hers but would expect her to give a strong solid performance to lift this song out of the ordinary. 7. "Kebabpizza Slivovitza" - Andra Generationen. Hey haven't we had enough joke entries this year? This week's comedy turn but all in all just a waste of time. 8. "One Love" - Johnson & Haggkvist. For two acts with their pedigree in this contest I expected better. However they just need to turn up tonight and will qualify. I like him, I don't like her, and would hope that she doesn't monopolise what is after all a duet! Will I be right or will I be wrong? All will be revealed later tonight. Everybody's got love today, love today, love today. Either "the day of love", or just a cynical commercial marketing opportunity for card/chocolate/champagne manufacturers to boost their annual profits. Depending on your situation, take your pick! Whatever, if you're celebrating it, enjoy! Was reading an old interview with superstar-in-waiting (if there's any justice) Paul Steel and he mentioned another singer-songwriter named Aaron King, who also comes from his home town of Brighton. It was enough to make me visit his MySpace page (www.myspace.com/aaronkingmusic) where there are a few demos to listen to. I'd describe Aaron as a musical cross between Paul Steel and the late great Elliott Smith, which I think is a good enough recommendation. Yet another one to add to the growing list of great keyboard-playing-singer-songwriters out there who deserve to be stars! Bit of a change this week: as MF is in full swing, I thought I'd do a list of some of my favourite MF songs since the year 2000. It's longer than the usual playlist but with good reason!!! 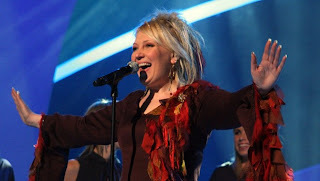 "Anropar Forsvunnen" - Hanna Hedlund (2000): The kind of schlager which is always popular at MF but never wins. Good fun. "Bara Du Och Jag" - Balsam Boys (2000): One of the most bizarre combinations ever - Swedish rapped verses with a fab chorus by Svenne & Lotta. No-one ever mentions this forgotten gem but I always liked it. "Allt Som Jag Ser" - Barbados (2001): the only song I liked that year and I was rather annoyed to say the least when it didn't win and "Lyssna..." did. No offence to Friends, but I liked their other MF entries better than that one. "Adrenaline" - Mendez (2002): This one is IMHO one of the best MF songs EVER!! An absolute classic which I played long after MF and still love it. "Aqua Playa" - Afro-Dite (2003): Have been playing this a lot again lately. Ooh-aah baby! "Not A Sinner Nor A Saint" - Alcazar (2003): Another absolute classic and what I thought was their best ever MF entry. "Bye Bye" - Barbados (2003): Another goodie. Didn't think I'd like them anymore after Magnus left, but this proved me wrong. "Mr Memory" - Shirley Clamp (2003): What a good year 2003 was...the year we were introduced to Dame Shirley at MF!! "It's In The Stars" - LaGaylia Frazier (2004): This was rather soul-disco-tastic and not really an MF-type song but again it lived on for a long time in my CD player long after MF was over. "Paradise" - E-Type (2004): Yes laugh if you must but I do like E-Type's type of dance music and this was a very good example of it. "Min Kärlek" - Shirley Clamp (2004): Lena deserved to win of course but this I think you will agree is a modern schlager classic. "Alcastar" - Alcazar (2005): Not as good as "Not a Sinner..." but it's in this list because I love them and I'm biased. "Refrain Refrain" - Pay TV (2005): Great lyrics.which themselves are a parody. A very different kind of MF entry again. "La Chica de la Copa" - Pablo Cepeda (2006): Mendez-meets-Ricky Martin - that formula couldn't go wrong for me but again it's maybe a little dated now. "Kalla Nätter" - Jessica Andersson (2006): MF always needs her and it's missing her this year. Anyway the song was great, but maybe the staging of it (and the outfit) wasn't. "Kom" - Jessica Andersson (2007): More glitterball-tastic-ness. I didn't really like her when she was in Fame but loved her solo MF stuff better. Fab disco-schlager. "The Arrival" - The Attic (2007): another one which lived on for a long time outwith MF because it's a very very good dance track. "Cara Mia" - Måns Zelmerlöw (2007): Need I say more? A classic. "Live Forever" - Magnus Carlsson (2007): It's still a mystery to me how this didn't qualify. 2008....the best is, presumably, yet to come!! Just want to say thanks for your kind wishes after last night's posting. Today I had a day off work, and it was just the boost that I needed, including a great lunch at our favourite Mexican restaurant. It was like a real spring day and according to the forecast there is more to come, so that can only be good news. Feeling much better tonight and more positive. The good thing is that when you hit the bottom, the only way is up and that's where I'm going now. I guess that's why they call it the (winter) blues. As you know I don't like using this blog to write about serious life/work stuff when I get much more fun writing about the things that take me away from all that. I like to think of this blog as quite an upbeat positive place to hang out so you may be surprised to learn that I do in fact suffer from a syndrome called "Seasonal Affective Disorder", better known as "SAD" which is probably a good description as that's how you feel for quite a lot of the time. Sorry to get a bit heavy tonight but I had to get that out of the way. Anyway I've got a day off work tomorrow to look forward to, in which I will be hanging out with my faithful travelling companion, having lunch and doing a bit of "retail therapy" no doubt. ...to my faithful travelling companion. Yes it's my significant other's birthday today so I thought I'd celebrate with some of his old favourites..
For the first time this year I was able to watch the MF experience live on the internet - thanks to SVT for a mainly flawless live stream. It began with a great James Bond-style intro - host Kristian Luuk being kidnapped by none other than Lasse Berghagen and Arja Sajonmaa (!) before escaping and heading off to the Scandinavium to present last night's show. Week 1 of MF is always notoriously the "rubbish one" with none of the big hitters. However I wasn't prepared for just how rubbish it would be. OK that's maybe a bit extreme, but let's just say that in all the years I'd been following MF, I can't remember a heat as unspectacular as this week's. Talking of unspectacular, I wasn't too delighted with the perspex and metal stage set either. It looked like scaffolding. I don't have a great understanding of Swedish, but Kristian Luuk was as ever a very comfortable host, and the in between song "postcards" were good fun. 1. "Line of Fire" - E-Type and The Poodles. The idea of this collaboration sounded quite exciting to me initially, but the end result was less so. Some old fashioned hair metal. I was expecting something a bit more techno/dancey and I wonder why E-Type even bothered showing up. 2. "Alla Gamla X" - Face-84. Looked like a schlager-pop version of Sahara Hotnights. Pleasant but that was all. A bit shaky in places, and I never ever saw it as a qualifier, even if it did throw in an awkward key change. 3. "Deja Vu" - Velvet. I was looking forward to hearing this as I still love "Mi Amore". Unfortunately her vocals were a big let-down, just not good enough. This fan favourite could have maybe qualified in the hands of someone like Jessica Andersson (sadly missed at MF this year). He's sooo young - looked as if he should be in "Hollyoaks". Simple piano ballad. I liked bits of this in a strange way, but it lacked a strong enough hookline and the one it did have became annoying after a while. 5. "That's Love" - Michael Michailoff. Tonight Matthew, I'm going to be Andreas Johnson. Very Johnson-esque style retro-rock-pop which Andreas does better. Mr Michailoff was a bit of a charisma-free zone and my attention wandered during this. 6. "Thank You" - Amy Diamond. There is no question that she is a very assured and professional performer for one so young. But that is the problem - she looks and sounds like a little girl, and this was more suited to Junior Eurovision than its adult version. This was always going to be a qualifier though. 7. "Visst Finns Mirakel" - Suzzie Tapper. From the youngest competitor to one of the oldest. I didn't see all her performance of this Eva Dahlgren-style ballad, but file it under the "oldies' career resurrection" section of the MF filing cabinet. 8. "I Love Europe" - Christer Sjögren. And file this under the "car crash" section along with this year's Estonian and Azerbaijan entries. LOL, LOL, LOL. The Vikingarna singer (even older than Suzzie Tapper), surrounded by Vegas-style showgirls, redefined the meaning of bad cheese. It did make me smile, for all the wrong reasons, but that didn't mean that people had to vote for it!! Prediction: Amy and Suzzie to Globen, Velvet and the Poodles/E-Type to Andra Chansen. Result: Amy and Christer to Globen, Suzzie and the Poodles/E-Type to Andra Chansen. Yes you heard right. Christer to Globen. All I'll say is ??????????? A bad night and a suitably bad result. Can't see any of last night's qualifiers as a possible winner, but Amy could be dangerous. Vincent Pontare is one of Sweden's brightest new singer/songwriter/producers. He released his debut album towards the end of 2007 and I now have my very own copy which dropped through my mailbox a couple of weeks ago. Despite its title, "Farewell" is the first track on the album (don't count the bizarre "Intro"!) and is a catchy, brassy reggae-type number and grows on you with every listen. "Cool Me Off" is musically a less frantic twin of "Miss Blue" whilst I could see "Tell Me" as a possible future single choice, it's a laid-back r'n'b style number with rapped verses. "Walking Crooked In A Straight Line" is another particular favourite of mine and I've been listening to this track quite a lot. I think he has a very bright future ahead of him both as an artist and also as a songwriter for other artists (Vincent wrote Amanda Jenssen's excellent "Do You Love Me" and Danny and Therese's "If Only You", to name two recent Swedish hits). All in all if you are a fan of good quality (Swedish) pop then I would recommend this album. There will be a review of tonight's (admittedly below-par) Melodifestivalen on here tomorrow. I just need time to recover from the result :-??? 1. "Get Up" - Crash: the kind of teen-rock-pop very much in vogue in Europe at present, but they struck me as a little old for this kind of thing? 2. "Andagassii" - Ann-Mari Andersen: Nice to see a Sami entry in the final, but I thought it was a little throwaway compared to the Stavanger semi-final version Poor draw position too. 3. "Hold On" - Tinkerbells: qualifier from the midweek Sistesjansen contest. Nice enough, but but they're still three Shania impersonators on a night out, and this was only ever going to be an also-ran. 4. "Am I Supposed To Love Again" - Veronica Akselsen: terminally old-fashioned ballad which could have appealed to some sectors of the ESC voting public, but I'm glad it didn't win. 5. "Far Away" - King of Trolls: Most cynical attempt this year to win Eurovision. It's as if they put Lordi, Roger Pontare and every remotely 'ethnic' entry into a blender and this was the result. That was why I didn't want this to represent Norway this year. 6. "Som I Himmelen" - Ole Ivars: another car-crash Sistesjansen qualifier. Swaying dansband for the over-90s. Did anyone hear little snippets of "Lady Lynda" in this one? 7. "Eastern Wind" - Torstein Sødal: I always thought this one was in with a big chance. He has such a powerful voice and yet again gave a commanding performance. 8. "Hold On Be Strong" - Maria Haukaas Storeng: A dream draw (never underestimate this) and this retro-Winehouse style is very popular at the moment (well at least in the UK anyway). Interval act: the living legend that is .....JAHN TEIGEN!!!! 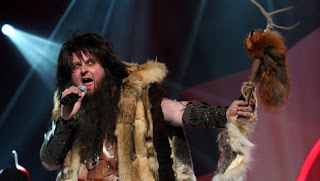 It was inevitable that MGP would give us the most famous of all Norsk ESC contestants in the final - and they delivered. The mighty Jahn - with that hair he looks like an ageing E-Type (!) gave us a medley of his hits and didn't disappoint the Spektrum audience. Superfinal: Veronica / King of Trolls / Maria Haukaas Storeng / Torstein Sødal. 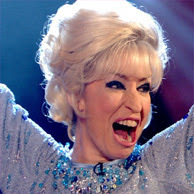 Interval act (again): Guri Schanke :(((((( think Geri Halliwell in about 40 years time and voila, Ms Schanke. Result: Maria won, Torstein 2nd, Troll bloke 3rd and Veronica 4th. MGP has seen better final line-ups over the years, but I'd call this a good result. Well done to Maria Haukaas Storeng, her song "Hold On Be Strong" (written by Mira Craig) will represent Norway at the Eurovision Song Contest in Belgrade in May. Anyway it was Quentin versus Claire-Marie and watching the clips from the prime it was very clear from the start that C-M had no chance. Vocally she was flat on the opening number "Pour Que Tu M'aimes Encore" and wasn't too spectacular with Calogero on "Aussi Libre Que Moi". Both duetted on "Quand a Que L'Amour" - Quentin excelled here and for some reason he reminded me a bit of Thierry Amiel. In between all that, finalist Mathieu was back to duet with Kylie on "Love At First Sight". Christophe Willem! Double Je! C-M wearing her glasses again! It was like a Specsavers convention (and before you complain, I'm short-sighted and wear glasses sometimes too). This was good fun. Kylie and Quentin: "Spinning Around". Quentin = star quality. The instrumental test: "Qui A Le Droit". Inevitably the old Bruel classic gets wheeled out at least once per series. This time Q & C-M were tested not just on their vocal but instrumental abilities. Q on piano, C-M on violin. A very nice duet. Calogero & Mathieu: "En Apesanteur". I know I need to change the record now, but - Mathieu. Is.Just.Not.Good.Enough.Vocally. Claire-Marie & Youssou N'Dour: "Seven Seconds". Sorry C-M but you are no Neneh Cherry. Youssou is always fab though. Christophe Willem & Mathieu: "Quelle Chance". Ooh this has been all remixed in a nice electro-dancey way and suited Mathieu's vocals better than his Calogero duet. Christophe rules! The evolution test: "Message Personnel" - Claire-Marie. She was very much at home on this which suited her vocal style - however nothing will ever convince me that she is anything more than a France Gall tribute act. Micky Green & Quentin: "Oh". This electro-jazzy duet was just made for Quentin. At one point the camera focused on Claire-Marie, whose facial expression just said...it's over, you win, I lose. The evolution test: "Medley Rock" - Quentin. Great choice too - the crowd-pleasing Seven Nation Army and I Was Made For Loving You, even if this is not really his style - he is more at home on jazzy soulful tunes. The next test was the students’ own compositions: "Il y a je t’aime...", by Quentin was a rather typical intense piano-ballad, then on to Claire-Marie’s rather cheesy guitar-flavoured song, which, I have to say, was catchier. Finally "Je Suis Venu Te Dire" was a nice duet to end with. Result: 62% of the voters wanted Quentin in the final, and I agreed with them. Homecoming - Kanye West & Chris Martin: Kanye continues to push the boundaries of commercial rap music, and this is one more example. Snakes On A Plane (Bring It) - Cobra Starship: Faithful travelling companion kindly lent me a copy of this Samuel L Jackson movie, which is just a guilty pleasure to enjoy. I liked the theme song too, and this is it. Do It Yourself - Uniting Nations: why wasn't this dance anthem a big hit? It should have been. In the meantime they will just have to settle for a mention on my playlist. 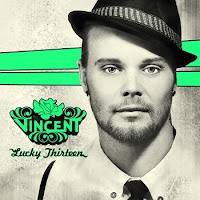 P.A.R.A.D.I.S.E./Farewell/Walking Crooked In A Straight Line - Vincent: fear not, that album review is on its way, and here are three rather good tracks from "Lucky Thirteen". Do You Love Me - Amanda Jenssen: I really like this, so what if it's just a Swedish version of Amy Winehouse? Why not? Rockstar - Nickelback: one of the more enduring UK chart hits of recent times, and it's not going away. I really like this now. Ready For The Floor - Hot Chip: I know the name, but hadn't heard their music till recently. Appealing, foot-tapping electro-pop-rock which has eaten its way into my brain. Wow - Kylie Minogue: Follow-up to "2 Hearts" which, IMHO, was drivel. This is more catchy, commercial, radio friendly...just a good modern pop record. God Put A Smile Upon Your Face - Mark Ronson: OK so this is old news but this brassy reworking of the Coldplay tune is currently all over TV as background music and indeed it's good background music to write this blog to....! Blogging legend on the radio! One of my favourite blogs is Work Your Magic... (http://workyourmagic.blogspot.com/) in which the legend that is Rachel shares her enthusiasm about Europop/Russian pop/popstars called Dima! As if that's not good enough you can now hear the dynamic duo - Rachel and Keira - on the radio! Their new radio show "Sounds of Europe" started tonight on GU2, the Guildford student radio station. Head over to http://www.gu2.co.uk/ and follow the listen live link. The show's broadcast from 11pm - 1am every Tuesday and is well worth a listen if you're into European music. Strange one this, as a few guests who've already been on this series are back again....but when they are Christophe Willem and Calogero then that is fine by me. Also on this week's show: Kylie Minogue, Youssou N'Dour and Anggun. (I must do something on here about Anggun one of these days, as she is one of those singers whom I like but keep forgetting about). Just like last week's semi-final there will be a series of "battles", this time between Quentin and Claire-Marie. And may the best man win. A few weeks ago I said on here that I thought one of my current favourite Swedish popstars, Vincent, had international hit potential. Well, now, Musikindustrin (http://www.musikindustrin.nu/) reports that Vincent has signed record deals to get his material released in Germany and also in the Benelux countries. Yay! That website also reports that the bearded one is currently in London, writing songs for his next album. I will get that "Lucky Thirteen" review on here one of these days, but what I will say just now is that it's a very good album, the two singles "Don't Hate On Me" and "Miss Blue" are admittedly the best tracks but there are a few other tracks well worth a listen. Highly recommended. Just a quick mention that TV5 is broadcasting the NRJ Music Awards next Saturday night from 20.00 - 22.00 UK time. This will be a great opportunity for those of us living outside France to catch their most glamorous music awards ceremony. On to the late 80s, to a duet from Blow Monkeys singer Dr Robert, and Kym Mazelle. Reminds me of my college days (along with lots of other songs which will all inevitably get posted here one day), it was just a good pop-dance tune of its time. 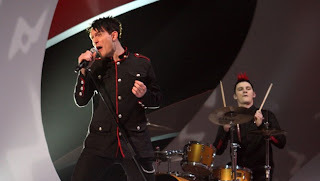 Breaking news: just like every other band from the last 20 years, The Blow Monkeys have also decided to reform! No, not the famous 80s "Brat Pack" movie, but an American band whose former members included Madonna (on drums!) and American Idol judge Randy Jackson (on bass) - not at the same time though. 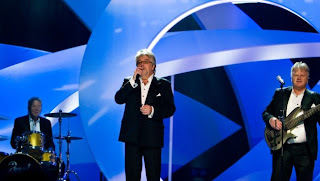 This is the first of the "Super Saturdays" of Eurovision national finals season 2008. Every year it never ceases to amaze me - that the "looking forward to" is inveitably better than the outcome. And so tonight was the same. Lithuania: I really don’t know what to make of "Nomads in the Night" by Jeronimas Milius. It’s all very theatrical, maybe too much so. This is more West-End-musical than Eurovision. He does have a good big voice, but the end result is excessive and another wasted opportunity. Denmark: I deliberately chose not to listen to all the Dansk Melodi Grand Prix songs, because I’ve been so disappointed over the last couple of years (especially last year when "Listen To Love" failed to make it). So I have only heard the winning song, "All Night Long" by Simon Mathew - and I quite like it! Good old-fashioned singalong which could have the same result as "Talking To You". And he’s quite good-looking, but he needs to ditch that flat cap, pronto. Estonia: sadly I failed to catch all the Eurolaul songs this year but have just heard the winning entry. Oh dear. An unfunny joke entry. On first listen "Leto Svet" by Kreisiraadio has no redeeming features. They were once one of my favourite ESC countries, but now their entries have become a waste of time. Utter rubbish. Azerbaijan: "Day After Day" by Elnur Gussinov. I am speechless, I can't deal with this at the moment, and probably won't be able to bring myself to listen to it for another three months. Latvia: First semi-final took place with the following songs going to the final: If I Only Knew / I’m a Part Of You / Summertime / Wolves of the Sea / Take Me Home. "Wolves" is an inevitable winner. The battle: Mathieu versus Bertrand. The guests: Florent Pagny, Christophe Maé, Hélène Ségara, Blue Man Group, Plain White T's, Sheila - along with next week's semi-finalists, Quentin and Claire-Marie. The verdict: Just not good enough. It was (IMHO) possibly the worst semi-final I'd seen/heard in all my years following Star Ac. Although Mathieu has strong public support - possibly as a reaction to his multiple nominations - and a good, marketable r'n'b-style image, he doesn't have the personality or vocal talent to match. Bertrand does have a big personality and matching dress sense, but again he lacks the magic you'd expect from a semi-finalist. Reiterating what I said last week, the standard should be exceptional at this stage - but it fell well short of that. 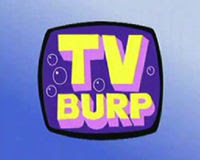 Over this series there has also been an increased number of songs sung in the English language, which I felt haven't always shown the contestants' singing talents to the full. Last night also saw the return of directrice Alexia Laroche-Joubert to the prime following her (very brief) period of maternity leave. After a number of 'battles' to test the semi-finalists' various abilities, the results were finally revealed. 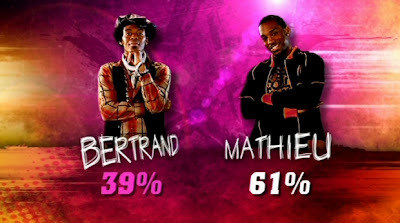 Mathieu is in the final but who will join him? Fingers crossed that it's Quentin.